Given the amount of customization I’d need to do with the Thar to make it fit into the family, there was no way I’d buy it on the company lease scheme. That meant that we’d have to forego the tax benefits and pay 10.5% interest p.a. to SBI on the 5 year vehicle loan. The proposal wasn’t sounding financially appealing, but nobody seemed to care about it now when our hearts are set on taking the plunge with the Thar. We’ve made a lot of our decisions so far based on gut feel rather than financial calculations and we don’t regret any of those, so this was one more addition to that list. So on one fine weekend in October, we went for a TD to India Garage with a couple of friends even though we had clear intentions of buying it eventually. I had TD’ed it earlier in 2011 but that was when there was no standard A/C fitment available. The Sales Rep (Khasim) was pretty good in attending to us and arranging for a test drive promptly. The A/C felt quite good in terms of the cooling power and with the windows rolled up, even the soft top did a reasonable job of cutting down the traffic noise. The India Garage guys had kept a pretty nicely done up Rocky Beige Thar on display, I was told that it had already been sold to somebody who had ordered the custom fitments. 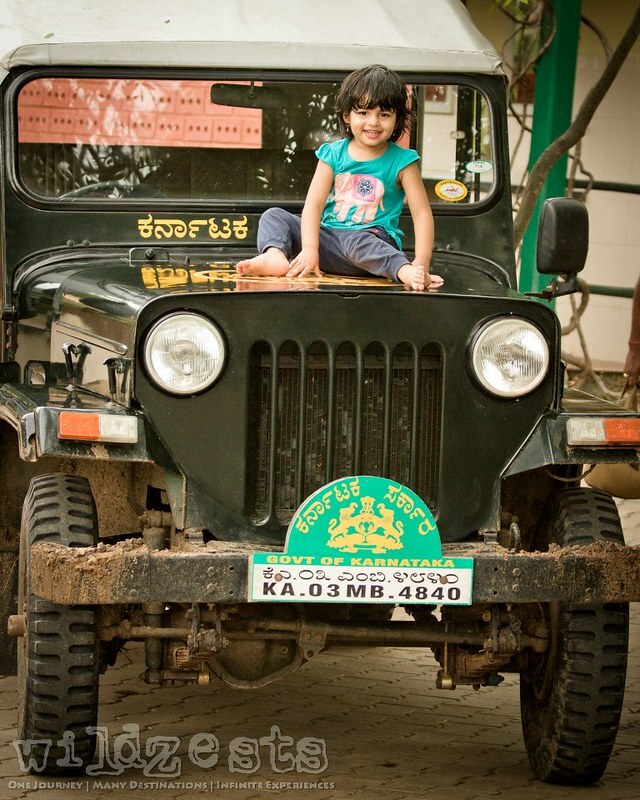 My 3yr old daughter who’s been an enthusiastic companion on all my wildlife trips associates jeeps to the jungle safaris. The moment I took the jeep out for a spin, she popped the question whether we were going to see wild animals and that made all of us have a hearty laugh. It was difficult to make her understand that were actually going to buy the jeep versus going for a safari. After the TD, we discussed about the availability and price with Khasim and he mentioned that there was a Black Thar readily available whereas the Rocky Beige would take about a month he said. My initial choice of color was the Rocky Beige, but given that Black has been our all-time favorite we decided to settle with it. I told him that I’ll be back on Monday with the loan documents and the down payment and that he should hold that Black Thar for me. The loan guy said he could get it done in 3-4 days and that meant I could pick up the jeep on the next weekend if everything works out. That next week was crazy and we couldn’t really get everything done on time, we barely managed to get the loan approved that Thursday or so. I could have pushed Khasim for delivery on Saturday but I was scheduled to be out on business travel for the next 10 days so decided to wait it out till I return back. The delivery date was pushed out to Nov 9th since that gave me some additional time to plan for the mods that were needed, the first of which was to find the tires I wanted. I had a made list of mods to be done right after delivery or within the first 2-3 weeks since my experience has been that anything that is scheduled to be for later never gets done. I’ve had that experience with the Safari where I thought I’d put the alloys and leather upholstery later and now that it’s been more than two years I don’t really feel the urge to put them at all. The idea was to do only functional mods and keep the bling factor to a minimum; the jeep had to be ready for the OTR events in 2013. Khasim informed me that there was a new batch of jeeps coming in the first week of November, so I would be able to choose from a new lot and may even have a choice of color if I change my mind. I was scheduled to return home on Nov 7 and had told them that I will inspect the jeep before it’s allotted to me and sent for registration. I did get a call from him that morning on Nov 7 informing me that the jeep will arrive for PDI later that day and I could drop in at the showroom and give a nod to send it for registration. Finally, the jeep arrived at 5.30PM and I was able to do a quick PDI and a test run before giving a final nod. Everything seemed to be okay so far and the VIN decoding thread on t-bhp helped in identifying that this was an October manufacture vehicle which was good. I was told that there could be a possible delay in delivering the jeep on Nov 9th because the request for the registration DD hadn’t been sent on that day and it could take an additional day. Having already taken a holiday on Friday, I was insistent that I get the jeep on Nov 9 given that I had informed them of the delivery date more than two weeks in advance. After a little bit of stern talking with Khasim and his manager, I get an assurance that they will make it happen on Nov 9th itself. The insurance quoted by the dealership was a bit too high for my liking and a couple of phone calls saved about 5K and got me a better deal with a Tata AIG zero-dep policy instead of just the standard comprehensive coverage. With the engine number and chassis number available after the PDI, I finalized on the insurance and had them send it to me within an hours’ time. On Nov 8, I got a call from the dealership that my car was sent for registration and will be ready for delivery on the next day as promised. That night, it took a while for me to fall asleep because of excitement and anxiety of getting the new toy. The following morning I promptly get a call from Khasim informing me that the vehicle will be ready for delivery by 11.30AM. My daughter was going to accompany me for the occasion while my wife had to rush to office for some work. We took a bus to get to the dealership and found it standing in the delivery bay, ready to be driven! The delivery process was pretty smooth overall and we were done in less than 15-20 mins. There was the usual picture taking event followed by a quick instruction delivery session about the features (or lack thereof) in the Thar. I picked up the Insect mesh and the lamp grills from the accessory shop which had to be installed at the workshop since the guy said he couldn’t get the fitting done there. I also spoke to Mr Chandrashekhar from the spares dept about ordering the SA roll cage to which he said that he had received two sets for the orders placed before me but both were unusable because of wrong parts being shipped. He promised me that he’ll place an order for me once that matter was sorted out, but that could mean about a month long wait for it. Not having too much of a choice, I decided to take his word and wait until there is a pressing need for it. I didn’t want to put the one sold by the accessories store since it felt more cosmetic when compared to the SA roll bar which looked a lot functional. The next stop was going to be at Madhus Enterprises for the tire change. While on the way to the showroom, I had told Nikhil that I’ll be visiting his shop for the tires and he made sure that it was all ready when I reached there. The tires had to be changed on priority right after delivery to get the best exchange price. I needed something more for off-road rather than highway performance and had zeroed in on the Maxxis Bighorn 245/75 R16. The most popular choice everywhere was the Yokos 255/65 R16, but I wanted an aggressive tread pattern rather than extra wide rubber. The reviews said good things about the off-road capability of the Maxxis and mentioned that they had decent on-road performance as well. After checking a few places, I had finally found them with Nikhil (Madhus Enterprises) who promptly booked the tires for me. The tires came in at a premium but I didn’t want to back out since I wouldn’t be changing these for quite some time. My wife wasn’t going to be home until later that evening, so we (my daughter and me) decided to hang out with one of our friends and share our joy. The jeep looks awesome with the new shoes and the black steel wheels, I could notice a lot of heads turning towards it that day. The next day I took it to Autoshop and got a new set of Osram 100/80W headlamp bulbs installed with a relay and also got the stock horns replaced with a pair of “skoda-type” Hellas. There’s still a lot to do and I can see myself spending a lot of time with the jeep over the weekends to finish the list of mods that are planned. 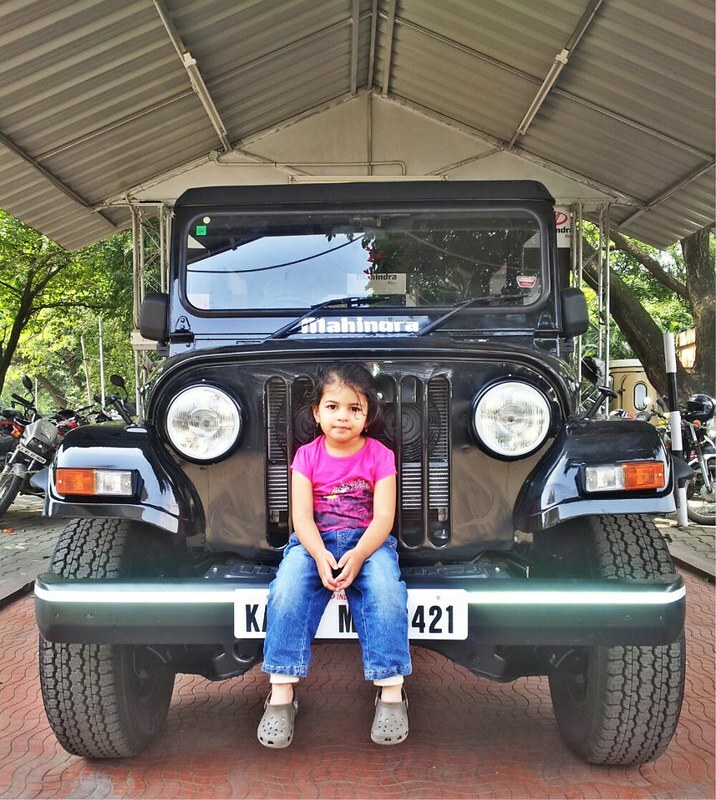 I love Mahindra Thar . I bought it from AutoPortal . It personality wise is so good and it gives better mileage .